The Sign of the Cross is a ritual gesture by which we confess two important mysteries: the Trinity and the centrality of the Cross. It is the most common and visible means by which we confess our faith. 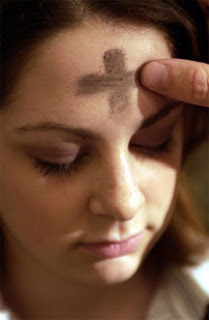 The Sign of the Cross is made by touching the forehead with the fingers of the right hand, then the breast and then the left and right shoulders. 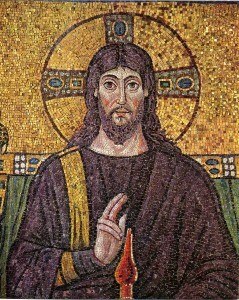 The sign was originally placed upon the forehead with the thumb and later extended to the whole upper body. This is not only a personal gesture, as a form of prayer but also a public witness and a sign of participation in the life of Christ and the Church. It is used as an integral part of many actions (e.g., at Baptism, Confirmation, prayer, to begin and end Mass, etc.). The Church has given us wonderful customs and traditions to mark ourselves and to acknowledge our participation in the whole continuity of the Church and the work of Christ. Miracles have been performed with this simple gesture and parliaments and councils have opened under its sign. Though Protestantism jettisoned this practice, along with the crucifix during the Reformation, the Catholic and Orthodox traditions faithfully continue this age old practice handed down from the age of the Apostles. 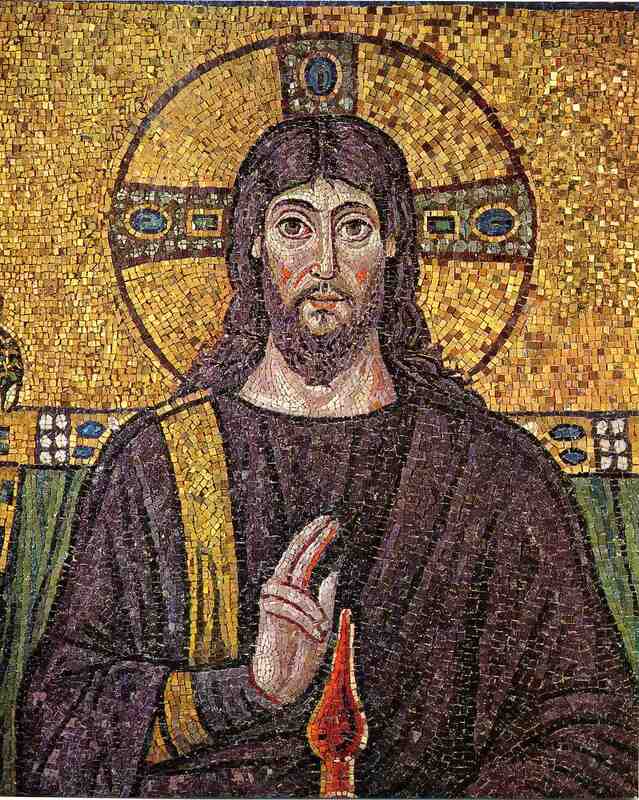 The Catholic Church has always seen outward gestures as means of expressing and actuating internal spiritual realities. 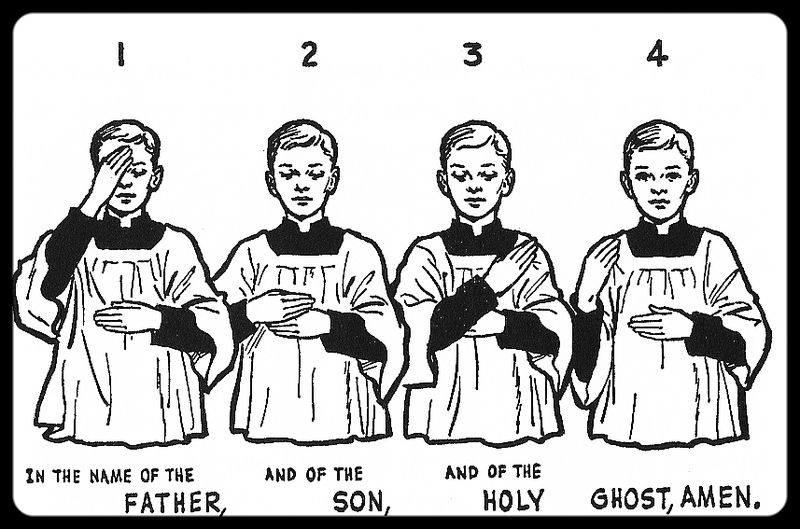 Sacramentals, such as the Sign of the Cross, are not superstitious practices but are sacred signs by which various things in life are rendered holy through the effectual and sacramental grace of God. By the Sign of the Cross we pledge allegiance to Christ and invite the Holy Spirit to apply the cross to our lives—to take up our cross and follow Christ. 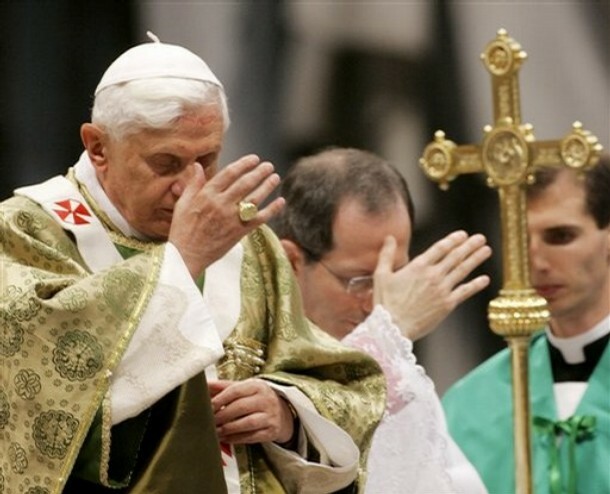 Though the NT does not specifically mention the “Sign of the Cross”, there is scriptural warrant for such a gesture. St. Paul writes, “I determined to know nothing among you except Jesus Christ, and Him crucified.” (1 Cor 2:2), and “may it never be that I should boast, except in the cross of our Lord Jesus Christ” (Gal 6:14). Ezekiel provides precedence for a sign upon the forehead of believers (Ezek 9:4; 17:9–14) as does Revelation (Rev 7:3; 9:4; 14:1). Ezekiel provided a support for the early Christians to use it as a “sacramental” (CCC 1235, 1668) to display their devotion to Christ and His Cross. There is reason to believe that the Jewish Christians used the Sign of the Cross prior to the destruction of Jerusalem in ad 70. 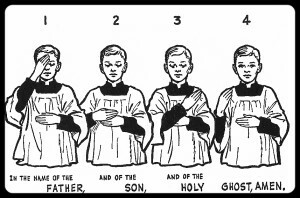 In the Catechism of the Catholic Church we learn: “The Christian begins his day, his prayers and his activities with the Sign of the Cross: ‘in the name of the Father and of the Son and of the Holy Spirit. Amen.’ The baptized person dedicates the day to the glory of God and calls on the Savior’s grace which lets him act in the Spirit as a child of the Father. The Sign of the Cross strengthens us in temptations and difficulties” (CCC, no. 2157; see also CCC, no. 786). The writings of the Fathers, as authentic witnesses to the apostolic teaching in the early Church, are replete with references to the Sign of the Cross. The practice is already well established in the 2nd century as attested to by Tertullian (ad c. 160-c. 225). He writes of the wife who “signs” her bed and body (To His Wife 5). He also writes, “At every forward step and movement, at every going in and out, when we put on our clothes and shoes, when we bathe, when we sit at table, when we light the lamps, on couch, on seat, in all the ordinary actions of daily life, we trace upon the forehead the sign. If, for these and other such rules, you insist upon having positive Scripture injunction, you will find none. Tradition will be held forth to you as the originator of them, custom as their strengthener, and faith as their observer” (The Chaplet 3, 4). Origen (ad c. 185-c. 284) wrote, “This [letter Tau] bears a resemblance to the figure of the cross; and this prophecy [Ezek 9:4] is said to regard the sign made by Christians on the forehead, which all believers make whatsoever work they begin upon, and especially at the beginning of prayers, or of holy readings” (Selections in Ezekiel. c. ix). St. Augustine (354–430 AD) wrote: “What else is the sign of Christ but the cross of Christ? For unless that sign be applied, whether it be to the foreheads of believers, or to the very water out of which they are regenerated, or to the oil with which they receive the anointing chrism, or to the sacrifice that nourishes them, none of them is properly administered” (Tractates on John 118). There has never been a time in the flow of historic Christianity that the Sign of the Cross has not been devoutly practiced. Only recently, since the Reformation, has the Sign of the Cross (along with the Crucifix, holy water and other visible signs) been rejected as idolatrous by many Protestant traditions. However, even Martin Luther in his Taufbuechlein retained the Sign of the Cross in the baptismal service and used the Sign of the Cross as one of his last gestures before death (H. Grizar, Luther, 3:435). Tertullian: Nicene and Post-Nicene Fathers, Philip Schaff, ed., Eerdmans, 1980, vol. 3, p. 94–95. Origen: The Faith of Catholics, Rev. Chapel, ed., Fr. Pustet & Co., 1885, vol. 3, p. 424. St. Augustine: Nicene and Post-Nicene Fathers, 1st series, Philip Schaff, ed., Eerdmans, 1983, vol. 7, p. 432. Grizar citation: Luther, Hartmann Grizar, B. Herder Book Co., 1919, vol. 3, p. 435.